My husband and I decided we couldn’t afford the glamorous holiday we’d planned in Morocco, so we went to Blackpool. Almost as good, right? Actually, we did have a great time. The first day we arrived, the place was dead, and a bit depressing, but as the week progressed, the town came alive. 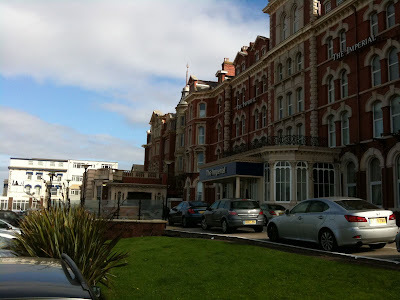 We stayed in the Imperial at the Northern end of the Promenade. From the waist down, it’s a luxury hotel, with beautiful lobby, a Declor spa and a health club. Unfortunately, from the waist up, it’s in need of a major upgrade, which I believe it’s in the process of rec eiving. Never-the-less, it was a good base from which to explore the Promenade. We arrived on the Monday. 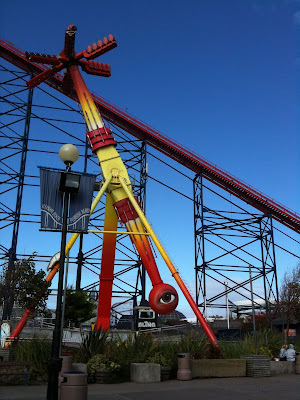 On the Tuesday, we took a tram (which is only marginally faster than walking) to the Pleasure Beach and spent a day on the rides. 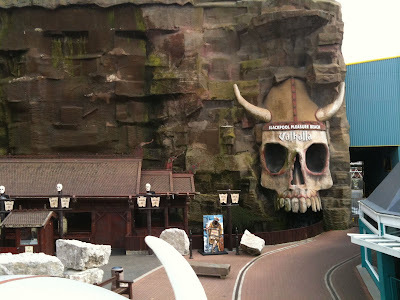 It started as a cold, wet day - no, not the weather, the fact that we foolishly decided on Valhalla as our first destination. A very wet ride that may have been a welcome break from the heat in July, but in late September is basically just a descent into hell. Wednesday turned out to be the best day. We went to Blackpool Tower, which is one of those bizarre hodge-podge attractions that are so representative of the town. There’s a half-arsed aquarium, a modest amusement arcade, a circus, restaurants, and of course, the famous ballroom. 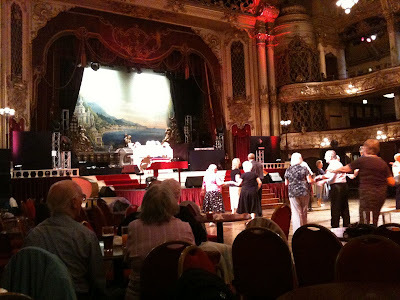 The ballroom boasts a bar and cabaret style seating, s o we bought drinks and sat down, and watched dozens of old people dancing to music being piped out of the Wurlitzer on stage. It was totally hypnotic and possibly the cutest thing I have ever seen. Wednesday night we explored the dark and quiet North Pier, which, with it’s abandoned carousel, empty theatre, and cold empty deck chairs had a sort of post apocalyptic feel. I imagine that this is what Britain would feel like after a deadly virus had been unleashed, or something like that. Before we went bac k to the hotel, we noticed that the mysterious ‘Funny Girls’ sign adorning the side of a large art deco building was lit up - we’d been curious about it all day, so we went to see what it was. It turned out to be the home of a fabulous drag cabaret, complete with intricate sets, sparkly costumes, impressive dance numbers, and sarcastic MC. 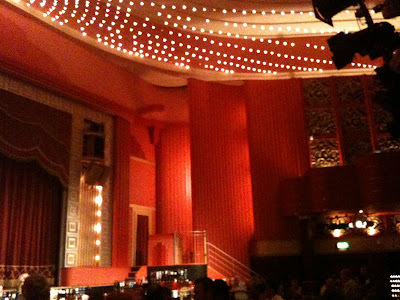 The inside of the building is a wonderfully preserved salmon pink art deco theatre, with balconies and velvet curtains. We had a fantastic time, and were very impressed by the acrobatics. The best part of Blackpool were the unplanned things, like the indoor market we found, or the library sale where we were able to fill up a box with books for a £1 - including work by Alan Warner, Iain Banks, and Michael Faber. And of course, Funny Girls, which was a brilliant surprise.